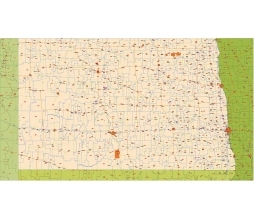 Editable royalty-free map of North Dakota, ND in vector-graphic online store. North Dakota zip code vector map 2015. 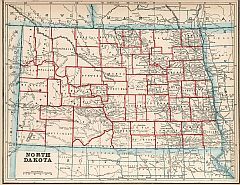 North Dakota State vector road map. North Dakota’s physical landscape can be divided into three steps going from east to west. The first, which is the most densely populated, is the Red River Valley. It has fertile soil and productive farming. North Dakota’s lowest point is in Pembina County at the Red River at 751 ft (229 m). 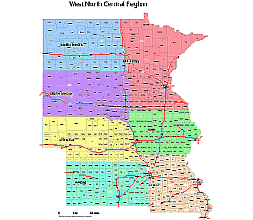 Going west, one hits the higher Drift Prairie region, made up of dark, fertile soil, rolling hills, lakes and streams, and the Turtle Mountains on the central northern boundary of the state.